Two teams, two tournaments, similar expectations but in the end the similar disappointing results. 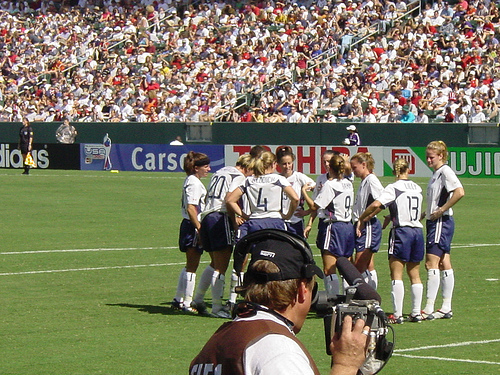 Starting with United States FIFA’s number one ranked team and their efforts at the Algarve Cup, a tournament they typically dominate reaching the final in 11 of the 13 tournaments held since 2000. Of those eleven they’ve won nine – this year instead they are rather embarrassingly for the program playing out the string going up against North Korea for the chance to finish 7th. Yes 7th. Not only did the Americans have a 43 game unbeaten streak snapped in a 1-0 loss to Sweden (ranked 6th), they followed that performance up by dropping a second consecutive game for the first time in 13 years when they were over run by Denmark 5-3 (13th). This after starting with a less than convincing 1-1 tie with Japan (3rd). Total damage: 3 games played, 0 wins, 1 tie, 2 lost, 4 goals scored, 7 goals allowed. Canadian soccer on the other hand can rarely claim positive streaks of any kind at the international level. The Canadian women though had such a streak. They were the only team that, up until this year, that had played in every final at the Cyprus Cup since the tournament launched in 2008. During that time the Canadians, currently ranked 7th by FIFA, were three and three in the final. 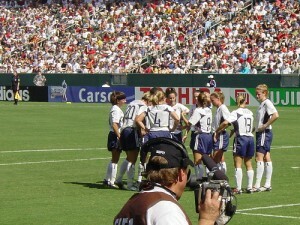 It was Canada’s third straight shutout loss to England the other a 1-0 loss in a friendly played last summer. Total damage: 3 games played, 2 wins, 0 ties, 1 loss, 6 goals scored, 3 goals allowed. Both coaches were expectantly somewhat philosophical about the results. American coach Tom Seermanni had similar things to say after the Denmark game. Both Canada and he U.S face some finishing issues. For Canada the challenge is finding someone other than Christine Sinclair to finish for them and to be fair in this tournament of the six goals scored only one came from Sinclair. Noting that though it is obvious that the better teams realize that if they negate Sinclair they increase their chances of victory. It’s something England appears to have mastered – others will take note. The Americans on the other hand are creating plenty of chances and despite being down 3-0 at the half against Denmark and eventually losing 5-3 could have even still won the game if they had been more clinical in front of goal. Over the three games the U.S. Out shot their opponents by an astounding 54 to 21 converting chances at a text book 10:1 ratio. They just need to convert. Defensively for the U.S. the problems are not quite so clear – the natural place to focus the search is the back line where Sermanni continues to experiment using a different back four in every game so far this year – but there may be more to it. Watching the game yesterday two things stood out – the Danes were clinical in front of goal scoring 5 goals on just 9 shots. Even more tellingly the Danes counter attack worked to perfection as they constantly overwhelmed an outnumbered American defensive line. The one question every time the Danes broke towards the American goal was where was the midfield tracking? If one thing is apparent with both teams it’s that the game itself is changing and evolving, quickly. Traditional soccer countries have started paying attention to the women’s game and are technically already as good or better than the North American sides. For Canada and the U.S. the gap in fitness and strength that always tipped the balance in their favour against smaller, technical sides is no longer enough to ensure wins. It’s a challenge that both can rise to face but time is running short – 2015 is not as far away as it seems and for the moment at least both would admit they are not where they want to be.